DENVER (AP) Trey Lyles was considered expendable by Utah on draft night in June. He did his best to show the Jazz it was a mistake to let him go. 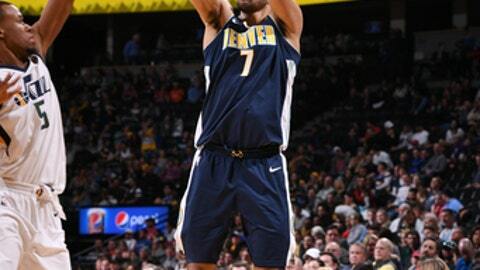 Lyles scored a career-high 26 points, Jamal Murray also had 26 points and the Denver Nuggets beat Utah 99-91 on Friday night. Lyles also grabbed seven rebounds. He averaged 21 points and 7.5 rebounds in the two home games against his former team to help the Nuggets split the season series with the Jazz. Lyles didn’t play in seven of the first 10 games of the season but has become a key reserve after Paul Millsap went down with a left wrist injury in November. He has scored in double figures in 12 of the last 13 games, but saved his best performance for his former team. Lyles and Murray, both members of the Canadian national team, each scored seven points in the third when Denver outscored the Jazz 38-16 after trailing by three at halftime. ”We were taking the ball out of the net the whole time when a team scores 38 points on you,” Snyder said. Donovan Mitchell had 15 points, seven rebounds and seven assists, Ricky Rubio also scored 15 points and Derrick Favors had 14 points and 10 rebounds for Utah. The Jazz have lost 12 of 15 since starting the season 13-11. The game was tied at 56 when Murray hit a 3-pointer, was fouled and made the free throw to start a 20-5 Denver run. Nikola Jokic, who missed his first four shots of the third quarter, capped the run with his first 3-pointer to give the Nuggets a 76-61 lead with 3:37 left in the third. Lyles converted a three-point play to extend the lead to 17, and Will Barton’s 3-pointer in the final minute of the period gave Denver an 84-65 lead heading into the fourth. The lead was 21 early in the fourth before Utah made a run to close within eight in the final minute. Jazz: Nuggets president Josh Kroenke played for Snyder at Missouri from 1999-2004. ”Josh was my first recruit,” Snyder said. ”You could count on Josh to do what he could do to help you win a game. That’s probably the best compliment you can give a player, and that’s how he’s running his team.” … C Rudy Gobert will have his injured left knee reevaluated next week. He has been out since Dec. 15. … Utah lost for the third time when holding an opponent to fewer than 100 points. Nuggets: Barton was feeling better after battling flu-like symptoms the past couple of days. He finished with 12 points and eight assists. … G Gary Harris had 13 points two days after matching his career high of 36. Barton’s illness hasn’t spread to the rest of the team but Nuggets coach Michael Malone isn’t taking any chances. Jazz: At Miami on Sunday. Nuggets: At Sacramento on Saturday night.